Thanks for taking time out of your very busy schedule to visit my blog. I really appreciate it. If you are tuning into this post about writing and haven’t seen part one, you can read it here. There I wrote about how I get my students in to a writing mindset. 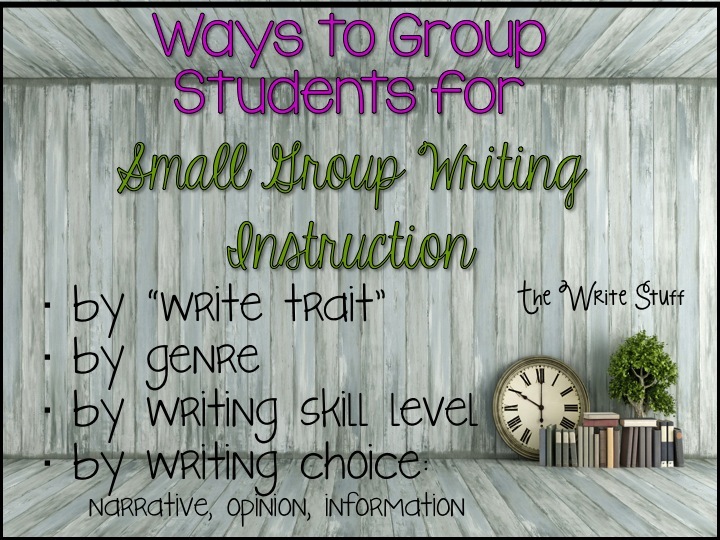 This post is all about grouping my students for small group writing instruction. I like to emphasize IDEAS in my class early on. The reason I do this is because there are many students with fabulous ideas but some of those students have difficulty expressing them in writing. Others have more simple ideas but can write pages! I would like my students to value ideas at the outset so that people are listening to ideas and the ideas that they come up with are appreciated. Also, this is a great way to take multi levelled students in one group where they can learn from each other and everyone is valued. At the beginning of the year, I teach students about the 6 Traits of Writing so that everyone understands some of the things that make authors great! Teaching the traits allows me to teach beginning, middle and end (ORGANIZATION), vocabulary (WORD CHOICE) and spelling and punctuation (CONVENTIONS) as they are integrated into the writing process. Students use Interactive Writer’s Notebooks and Author Studies to learn more about each trait. As students begin narrative writing I will pull groups based on a trait. At the beginning of the year, it is IDEAS. I take small groups of 4-5 students at a time and I can see all students in the week. I try to mix up the groups with varying levels of writers. I created this cute little flip book on the 6 Traits of Writing for you to use as you work on your writing. You can download it for FREE here. Let me know what you think of it! 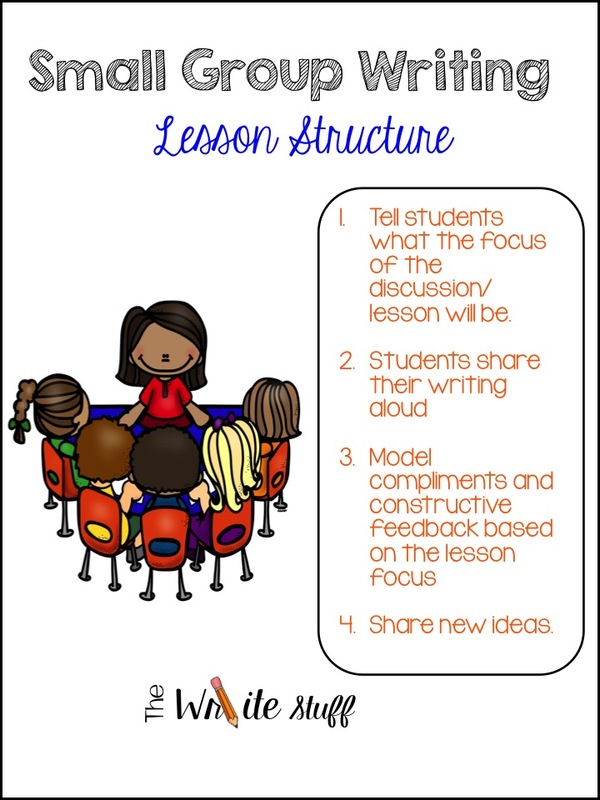 This is the basic structure of our small group lesson although it can vary depending on the discussion. I take notes about student learning and where I need to go next with them using literacy checklists. As the school year moves on and students are familiar with the write traits and have sat in on a group while we emphasize that, I may decide to group my students differently. I might group them in levels of strong writers, average writers and writers needing support. This way, the strong writers can thrive with the impact that others’ powerful ideas will have on them. The average writers will feel a sense of comfort in that setting and I can work extra hard with the struggling writers finding out just what is causing them to struggle and provide more mini-lessons. Another way I might group students is based on the type of writing that they have chosen to do if we are working on a “free choice” writing format. I might take the informational writers, the opinion writers, the persuasive writers, the narrative writers. Older students may benefit from choosing a genre and that would become your criteria for your next set of groups. Really, the combinations are endless! I will often finish the lesson and then allow the students to remain at the rainbow table because they begin to discuss their writing and bounce ideas off each other because it is fresh in their mind. Throughout the whole class writing lessons on traits, I am also giving mini lessons on conventions as they come up in their writing (journals are great assessment for learning tools!) I save the explicit lesson for a little later once they have become comfortable with the PROCESS of writing. I will share that in a future post. In the last of this series on small group writing instruction, see how I use my data to move kids forward in their writing skills and how I make adjustments for students with special needs.